That’s how the award-winning BBC reporter and presenter Robin Lustig started out in journalism, working for Reuters as an agency man. During a distinguished career spanning more than forty years, he watched the world of news change beyond recognition, as he reported on terror attacks, wars and political coups. 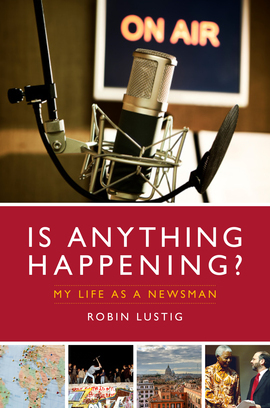 In this witty and illuminating memoir, Lustig looks back on his life as a newsman, from coming under fire in Pakistan to reporting on the fall of the Berlin Wall; from meeting Nelson Mandela to covering Princess Diana’s sudden death. Back in the studio, Lustig lets us in through the BBC’s back door for a candid, behind-the-scenes look at some of his triumphs and disasters working for the nation’s favourite broadcaster. He writes of his childhood as the son of refugees from Nazi Germany and, drawing on thirty years of reporting about the Middle East, he comes to a startling conclusion about the establishment of the state of Israel. Astute, incisive and frequently hilarious, Is Anything Happening? is both an irresistible personal memoir and an insightful reflection on world events over the past forty-five years.